A very common patient question the team at dhealth Dentistry encounters is, ‘How can you improve my smile’? Often, the patients who ask this have wanted a brighter, straighter, more beautiful smile for years. And yet, they have never sought (or been given) an evaluation by an experienced dentist, or discussed the wide range of cosmetic dentistry makeover options available to them. Step 1: After an initial discussion with Jane, together we worked on a cosmetic dentistry plan that addressed her ongoing dental problems and met all of her financial and budgetary needs. Step 2: Once we’d agreed on the plan, we organised a Digital Smile Design (DSD) mock-up for Jane. This provided a very realistic guide (complete with images of Jane’s real-life mouth and teeth) of what Jane’s straighter and whiter smile would look like on completion. 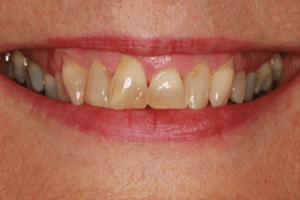 This important step ensured that there were no surprises for Jane at the end of her cosmetic dentistry treatment. Step 3: A full wax model work-up of Jane’s teeth was prepared, which allowed her to visibly see (and feel) exactly what the final result would be like. This gave Jane the opportunity to make any changes she wanted, prior to starting treatment and finalising her treatment plan. This collaborative process, with plenty of opportunities for feedback and discussion is a big part of the key to our success. 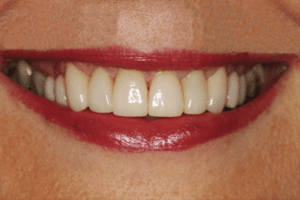 Step 4: Jane had a set of 10 porcelain veneers applied to her upper teeth, which instantly changed her smile and gave her a younger, brighter, more stunning smile.